For those of you self-publishing a book, this site is one-stop shopping! They have a database of over 3000 media contacts, distributors, printers, designers, publicity firms, and special sales. There is a membership fee, but the first 14 days are free! One of the members of The Writer's Meow, an online writer's club I manage, just published her book! Summary: A noble girl, an assassin, and a soul-stealing necklace... what more could go wrong? Sora always dreamed of adventure, but not like this. After being kidnapped by an assassin, she finds herself dumped into a dangerous world of thieves, mercenaries, and magic. A vengeful sorcerer is hot on the assassin's heels, and thanks to her Cat's Eye necklace, it falls into Sora's hands to save the assassin's life. Unfortunately, her necklace has as much an appetite for souls as it does for magic, and it is becoming even more of a danger than the sorcerer that hunts them. Now she must travel with an unlikely band of outlaws to discover the mysteries of the Cat's Eye, the secrets of her past, and how to destroy a man whose power is more than legendary. "Principle #1 The 250x250 Rule - It's not who you know, it's who your clients know that is important. "Principle #2 Build a database and ABC it. "Principle #3 'Just Let Me Know' - Educate your clients through what you say and what you send them on a consistent basis. "Principle #4 The power of a KeepInTouch program." When preparing for the launch of your book, compose a list of all your contacts. In addition to family & friends, add all business contacts as well. Include Internet contacts. Also school and church contacts. Don't sell yourself short - put down every contact!! Do not predetermine who will or will not be interested in your book - or who may or may not be able to assist you further down the road! "You can't do it all yourself. Don't be afraid to rely on others to help you accomplish your goals." Every format of a book needs its own ISBN. This is how the store, etc. knows which version to order! The hardback has one ISBN, the paperback another, if it's a book on CD, that has another... you get the idea! "Bureaucracy: A group of disorganized, inept people totally committed to increasing their numbers in order to convert raw energy into solid waste." - from Zig Ziglar's "Something to Smile About"
"No matter what the level of your ability, you have more potential than you can ever develop in a lifetime." 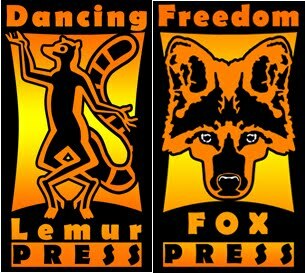 When submitting work to a publisher, it is critical you follow their guidelines! If they accept direct submissions, they will have their guidelines posted on their website. They will all require a query letter, which must be composed according to the standard and will be the most important piece of work you ever write. They may also require a synopsis; an outline; or the first three chapters. Never send more that what they ask and always include a SASE for a response - or you will not get a response! And be prepared to wait - most publishers take 3 months to one year to review submissions! "Half a century of trying to relieve people in distress has left Ruth and me convinced of three things. 3. The basic tools of problem solving are available to anyone." Ted is the son of missionaries John and Helen Dekker, whose incredible story of life among headhunters in Indonesia has been told in several books. Surrounded by the vivid colors of the jungle and a myriad of cultures, each steeped in their own interpretation of life and faith, Dekker received a first-class education on human nature and behavior. This, he believes, is the foundation of his writing.After graduating from a multi-cultural high school, he took up permanent residence in the United States to study Religion and Philosophy. After earning his Bachelor's Degree, Dekker entered the corporate world in management for a large healthcare company in California. Dekker was quickly recognized as a talent in the field of marketing and was soon promoted to Director of Marketing. This experience gave him a background which enabled him to eventually form his own company and steadily climb the corporate ladder.Since 1997, Dekker has written full-time. He states that each time he writes, he finds his understanding of life and love just a little clearer and his expression of that understanding a little more vivid. Dekker's body of work encompassing seven mysteries, three thrillers and ten fantasies includes Heaven's Wager, When Heaven Weeps, Thunder of Heaven, Blessed Child, A Man Called Blessed, Blink, Thr3e, The Circle Trilogy (Black, Red, White), and Obsessed, with two more...Renegade, and Chaos to be released later this year. He died once to stop the killer...now he's dying again to save his wife.FBI behavioral psychologist Daniel Clark has become famous for his well-articulated arguments that religion is one of society’s greatest antagonists. What Daniel doesn’t know is that his obsessive pursuit of a serial killer known only as “Eve” is about to end abruptly with an unexpected death-his own.Twenty minutes later Daniel is resuscitated, only to be haunted by the loss of memory of the events immediately preceding his death.Daniel becomes convinced that the only way to stop Eve is to recover those missing minutes during which he alone saw the killer’s face. And the only way to access them is to trigger his brain’s memory dump that occurs at the time of death by simulating his death again…and again. So begins a carefully researched psychological thriller which delves deep into the haunting realities of near-death experiences, demon possession, and the human psche. 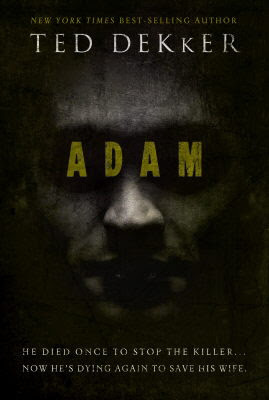 "As always with a Ted Dekker thriller, the details of ADAM are stunning, pointing to meticulous research in a raft of areas: police and FBI methods, forensic medicine, psychological profiling-in short, all that accompanies a Federal hunt for a serial killer. But Dekker fully reveals his magic in the latter part of the book, when he subtly introduces his darker and more frightening theme. It's all too creepily convincing. We have to keep telling ourselves that this is fiction. At the same time, we can't help thinking that not only could it happen, but that it will happen if we're not careful." New York Times best-selling author Ted Dekker unleashes his most riveting novel yet...an elusive serial killer whose victims die of unknown causes and the psychologist obsessed with catching him. If you are an author, you need to be prepared at all times. That means having books and bookmarks with you everywhere you go! You should have some bookmarks in your bag to give out to those you meet or leave behind with a waitress. (Men can carry business cards in their wallets.) And you should have a copy copies of your book(s) in your vehicle, too. Someone is going to say they want one and if you don't have them handy, you will miss a sale! Since you should be doing something every day to promote your books, this is one small way to accomplish that task! Here is an unusual tip for those who hit the road for appearances! Fastest moving freeway traffic - definitely I-95. If you are not going ten miles over the speed limit, you WILL be run over! Longest drive times within a city - three way tie. Orlando is #1 - no way you can get from one side to the other of Orlando and its surrounding cities in less than an hour. Same goes for Albuquerque. And you might be able to do it in Atlanta at 3am in the morning! Worst roads - toss up between Nebraska and Arkansas. Absolutely, positively no straight line to any destination point - North Carolina, hands down! Unsafe to speed - Texas. Watch for cops! Most boring drive - toss up between Idaho and Oklahoma. Speed limit ignored most often - near Richmond, VA. There's a 40 mile stretch that varies between 55 & 60, but NOBODY goes under 70! Traffic I would least like to be stuck in - DC is bad, but Atlanta wins. Seven - eight lanes both ways, and they'll be backed up for MILES!!! Any other suggestions? Please let me know! Having the proper amount of space to work is important! That is why I am delighted to report I have an office once again and a new desk that can hold both computers! You Must Have A Display! The worst thing an author can do at a book signing (besides sit there like a bump on a log) is not to have a display! You need to have posters displaying the cover art of your book. You should have a press book or sell sheets so people can read about the book. And you positively need bookmarks to hand to customers! Get creative with your display. If visiting a store around a holiday, theme your display appropriately. Have a bowl of candy. Have balloons. Set up your display to attract attention!! Taking a break today from the usual tips to give you one related to Valentine's Day. There's a million relationship books out there, including some really outstanding ones. But the best book to read for any relationship is The Five Love Languages by Gary Chapman. Chapman covers the five languages - acts of service; gifts; words of affirmation; physical touch; and quality time - and how to recognize them in others and yourself. Once you know someone's love language, you'll be able to respond to them in a manner that says love to that individual. If you haven't read The Five Languages, do so today! * It also helps develop character relationships, too! Michael Snyder has spent the bulk of his professional career in sales, has fallen in love, and continues to struggle with the balance between art and vocation. He's never investigated a murder, much less that of an allegedly clairvoyant dog. 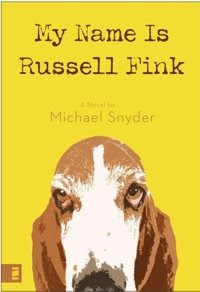 Russell Fink is twenty-six years old and determined to salvage a job he hates so he can finally move out of his parents house for good. He's convinced he gave his twin sister cancer when they were nine years old. And his crazy fiancée refuses to accept the fact that their engagement really is over.Then Sonny, his allegedly clairvoyant basset hound, is found murdered.The ensuing amateur investigation forces Russell to confront several things at once-the enormity of his family's dysfunction, the guy stalking his family, and his long-buried feelings for a most peculiar love interest.At its heart, My Name is Russell Fink is a comedy, with sharp dialogue, characters steeped in authenticity, romance, suspense, and fresh humor. With a postmodern style similar to Nick Hornby and Douglas Coupland, the author explores reconciliation, forgiveness, and faith in the midst of tragedy. No amount of neurosis or dysfunction can derail God's redemptive purposes. When submitting work to a publisher, if you are offered a contract, have a lawyer familiar with the publishing industry look over it first before you sign! There are many subsidy rights and you could find yourself losing all of them if you don't have a lawyer examine the contract first. For more details and some articles on the subject, I highly recommend Ivan Hoffman's site - he is one of the best publishing & writing laws lawyers out there! Watch the repetion of words in your work. Sometimes this can be avoided by simply referring to a Thesaurus. Other words may require the resturcturing of a sentence. One of my biggest hurdles became the word WAS. My slogan became "Stop the WASes!" She was flattered by the praise and began to blush. Flattered by the praise, she began to blush. Find creative ways to eliminate the words you repeat most often! One thing every writer and author needs in their life is a cheerleader. They instill courage, confidence, enthusiasm, boldness, and comfort. I may have posted this article previously, but it bears repeating! Does the words “book signing” terrify you? Fear not! I thought writing The Circle of Friends the best part until I began making public appearances – now I cherish getting out and meeting the readers. As a book signing road warrior (over 250 stores), I would like to offer you a few fresh ideas to help get your campaign off the ground. I recommend before you start your book signing adventures a few books to help you hone your interpersonal skills (useful when dealing with store managers and the media). Hopefully you already have a website and/or blog in place and are part of several writing communities. This will assist with promoting your signings. When you are ready to begin prospecting for venues to sign in, research every bookstore in your state. Once you create your signing strategy, open your calendar and start making calls. When I get the manager or owner on the line, I give them my pre-planned “commercial.” I tell them my name, book title and genre, a brief description of my book, and finish by asking what information they require to consider an author for a book signing. Many managers simply have asked for my ISBN and booked me on the spot, while some ask for additional information. For those that request printed information, I send my sell sheet, business card, sample reviews and a cover letter in the mail. I always keep track of every contact and I follow-up within a week to set up a signing time. When I call back, many accept my request. A few pass on the opportunity. Don’t be discouraged if you receive a negative response. Politely thank them and go on to the next call. With the date set, I send the store bookmarks and a poster or flyer for promotions. Then I conduct media research. I contact the features department of the local newspaper and producers of radio and TV news programs. (You’ll find that many stations are eager to feature someone interesting!) Many media sources have online event listings, so request that your appearance be listed. If you have a Web site or blog, update that information too. Send out invitations via e-mail to all of your fans in that area. I keep the bookstores abreast of all the articles and appearances so employees become excited about the signing as well. I have one rule: never sit! Roam the store, greet customers and place either a copy of your book or a signed bookmark in their hand. Set up colorful posters, a copy of your press kit, bookmarks and a big bowl of sweets on your table. Consider taking pictures of the individuals who purchase your book to make the event memorable. When the signing is finished, give each employee a signed bookmark and autograph any remaining books. Let them know that you appreciate any hand selling that they do for your book. When I follow these steps, managers, without fail, ask me to return soon! Don’t forget the important step of sending a thank-you note to the store staff and those responsible for media coverage you receive. A thank you goes a long way, and you’d be surprised how many authors fail to complete this simple task. In the note to the bookstore, I always include photos taken of the staff at the signing so they remember the day. Note details of the signing for future reference. Touch base with each store periodically through updates and press releases. This past holiday season, each one of my contacts received a Christmas letter. When the announcements went out for my fourth book, Mike, I sent a Valentine. 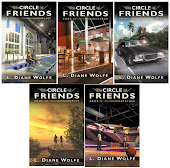 These little touches assure future signings for the remainder of my series, The Circle of Friends. Marketing and promoting a book requires a tremendous amount of energy, effort and research. I studied marketing books & websites and embraced every suggestion, determined to overcome all obstacles and rise above average. I’ve poured all of my enthusiasm into every recommendation because this is my dream. If you haven’t already, go after yours! The number one thing to consider before you begin writing is where will you sell your books and who will buy them? If you are writing a non-fiction piece, you have a lot of niche markets open to you beyond the bookstore! You could have a large organization purchase your book and implement it into their curriculum or make it available for their members. You could have specialty stores that will carry your books. It could become required reading for a school. You could find your niche audience online, too. There are so many possibilities - but you have to plan ahead. Don't write the book first and then wonder who on earth will purchase it! Website Must for Future Authors! It's called Preditors & Editors! They list all of the agents, editors and publishing companies out there, and if they have a bad track record, you will know! If the one you are considering has any red comment, that is a red flag - run away as fast as you can! Rebeca Seitz is Founder and President of Glass Road Public Relations. An author for several years, PRINTS CHARMING was her first novel.Rebeca cut her publicity teeth as the first dedicated publicist for the fiction division of Thomas Nelson Publishers. In 2005, Rebeca resigned from WestBow and opened the doors of GRPR, the only publicity firm of its kind in the country dedicated solely to representing novelists writing from a Christian worldview.Rebeca makes her home in Kentucky with her husband, Charles, and their son, Anderson. Sisters, Ink marks the first in a series of novels written by, for, and about scrapbookers. At the center of the creativity and humor are four unlikely young adult sisters, each separately adopted during early childhood into the loving home of Marilyn and Jack Sinclair.Ten years after their mother Marilyn has died, the multi-racial Sinclair sisters (Meg, Kendra, Tandy, and Joy) still return to her converted attic scrapping studio in the small town of Stars Hill, Tennessee, to encourage each other through life’s highs and lows.Book one spotlights headstrong Tandy, a successful yet haunted attorney now living back in Orlando where she spent the first eight years of her life on the streets as a junkie’s kid. When a suddenly enforced leave of absence at work leads her to an extended visit with her sisters in Stars Hill, a business oppor­tunity, rekindled romance, and fresh understanding of God’s will soon follow. "Fun . . . funny . . . fantastic! Rebeca Seitz has brought together scrapbooking and sisterhood in a lively romp, with a love for going home again." --Eva Marie Everson, coauthor of The Potluck Club series. Before rushing into the publishing phase, know all of your options! There are so many out there - self-publishing, traditional publishing, POD Publishers, E-Books, etc. - make sure your choice is the best option for YOU! Research each of these areas carefully and know what you are getting into before you leap into the project. Understand POD Publishers and the vanity/subsidy press lable; research every step of the process if you intend to self-publish; be aware that you should never, ever pay a traditional publisher or an agent to review your submission. And remember, no matter what path you take, YOU are responsible for marketing and promotion! A writer should alwys stay on top of current events. The Patriot's loss in the Super Bowl should supply ample opportunities. Writers with a background in football, strategies and psychology will be called upon for their expert opinion. There are endless angles to be taken based off of last night's game and the results! Keep up with Google Alerts! Put in your key word(s) and have Google send you a daily alert whenever those words show up in a news article or blog. If you are a non-fiction author, make sure to get daily alerts on your book's topic - this will give you an opportunity to follow up with comments or offer yourself as an expert on that subject. If you are doing marketing research, you will more easily locate blogs & sites that tie in with your subject. You can begin commenting on blogs that focus in your topic's area or are of like minds. You will also discover places that might review your book, do an interview or feature, or allow you to advertise. One concern that I hear writers express is what becoming an author will do to their life. I'll tell you right now, your life will change! You will find yourself in the spotlight and may have to adjust how you conduct yourself in public. You will need to be more outgoing and accessible. You will have to learn to do interesting interviews and speak properly in front of a crowd. You will have to keep good records of your expenses and contacts. You will make phone calls and live by your calendar. You will have to learn to balance your family life and perhaps involve them in the process. Housework may slide a little and hobbies put on the back burner. Basically, the chaos becomes the balance if you do it right! But to grow, you must change. To be alive means to take risks and try new things. So do not let the changes frighten you. Welcome the new adventure you have begun!